Ever see one of those paintings that looks magnificent from afar, but up close is a wild and distorted mess? That’s analogous to the performance of the Atlantic City gambling market in September. At a glance, all looks good. Overall revenue was up a staggering 21.7%, from $235.6 million in September 2017 to $286.8 million last month, a mark that was just a tick worse than what we observed for August, when revenue jumped 22.5% year-on-year, to $299.8 million. But the Atlantic City of September 2018 had quite the different look of the one just 12 months prior, with two new casinos, sports betting everywhere, and an expanded online gambling market. In truth, growth of $51.2 million comes off as a mild disappointment, and a worrisome sign for some of the boardwalk city’s older casinos. Land-based casino revenue (excluding sports betting) was up 7.7% in September, to just a shade under $232 million. However, new casinos Ocean Resort Casino and especially Hard Rock Casino accounted for a meaty chunk (17.36%) of that number. As for the old guard, six of AC’s remaining seven casinos took a hit, with four of them suffering year-on-year losses that exceeded 10%. The biggest loser was Borgata, which saw the composite of its table game, slot, and poker revenue slip more than $9.4 million (-13.5%) to $60.5 million. 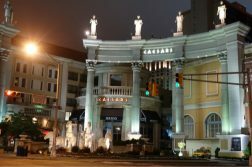 Caesars, one of the few Atlantic City casinos without a physical sportsbook, also took a tumble, with revenue nosediving 23.2% to $22.9 million. Harrah’s and Resorts were also victims of steep declines, 13.7% and 11.2%, respectively, while Golden Nugget and Bally’s saw revenue dip slightly. The only “old guard” casino that didn’t take a hit was newly revitalized Tropicana Casino, which increased its revenue by a whole 0.5%. Interestingly enough, Tropicana is one of just three AC casinos that doesn’t yet offer sports betting. In total, the seven casinos that were operating prior to June saw year-over-year losses of 11.3%. Factor in sports betting revenue, and this figure becomes less depressing, even producing enough revenue for Golden Nugget ($1.12 million) and Resorts ($8.79 million) to turn a negative into a positive. But both of those casinos were highly reliant on non-casino branded online books like Play SugarHouse and DraftKings Sportsbook for their sports wagering revenue. Land-based sports betting, while up (it was September after all), just didn’t appear to be a massive driver of traffic to table games and slots, as some predicted it would. At least not yet. There was one source of Atlantic City revenue that both existed last year and produced some hefty gains, and that was iGaming. Despite a laughably bad month from the declining online poker market, online gambling revenue was up an impressive 26.3% to $25.8 million. Online casinos had a record breaking September, clocking in at $24.1 million, up a whopping 30.6%. Admittedly, new online casino outlets from Hard Rock Casino and Ocean Resort accounted for some of these gains, but most of the uptick came from existing operations. 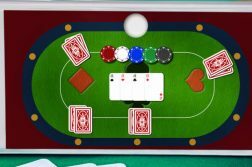 In other words, whereas new land-based casinos cannibalized revenue from the old guard, newly-minted online casinos were additive to the iGaming industry. While it’s too early to tell for certain, we believe that the record breaking performance of online casinos had something to do with select operators integrating their online sportsbooks into existing online casinos platforms. As the months roll by, we should see more and more of this, leading to more crossover between the two verticals, and presumably, even bigger numbers for online casinos. The biggest boost to AC revenue came not from the proliferation of sports betting, but from the city’s two newest tenants. Hard Rock continues to be the more successful of the duo, generating $25.9 million in September, good for fourth place out of nine. Ocean Resort continues to occupy the cellar, with revenue of just $14.9 million. Ocean did get a bump from its recently debuted permanent sportsbook, which took in just under a $1 million, and $292k from online sports betting, but that still wasn’t enough to push it past Resorts, which now generates nearly half its overall revenue from online verticals, and Bally’s, which took in $17.2 million from all its gambling offerings, including newly-launched Caesars online sportsbook. Ocean appears to be headed for some rough waters, as its casino win is frighteningly reminiscent of the now defunct Revel, which occupied the same building before going bust in August 2014. Overall, the NJ sports betting industry was healthy with revenue soaring in September due to new books opening and of course, the beginning of the NFL season. Atlantic City casinos captured the lion’s share of the market, accounting for $14.5 million of the industry’s $24 million in revenue. That works out to 60.6%. However, AC casinos hold six out of eight sports betting licenses, with the others owned by two racetracks: The Meadowlands and Monmouth Park. Not to mention, $8.5 million of AC’s sports wagering revenue came solely from Resorts Digital. Sources from DraftKings tell NJ Online Gambling that the operator was responsible for approximately 95% of that figure, with new kid on the block BetStars NJ making up the rest. As for land-based sports betting revenue at Atlantic City casinos, well, it wasn’t much — just under $4.9 million and only a half-a-million more than the FanDuel branded book at the Meadowlands did on its own. 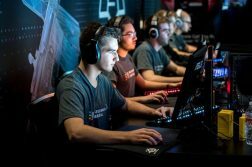 One highlight was the performance of the brick-and-mortar sportsbook at the Borgata, which saw its revenue nearly triple from to $805k to just under $2.4 million. Overall, the second half of 2018 is turning out to be a celebratory one for Atlantic City, which struggled mightily dating back to the Great Recession of 2008. Call it a revitalization, even. But now that Hard Rock and Ocean Resort are open, as well as a good chunk of the city’s land-based and online sportsbooks, there just aren’t too many new revenue generating avenues to explore. Beginning in 2019, the city’s growth may no longer be dictated by the addition of new online sites, sportsbooks, and casinos, but instead by how AC operators leverage their brands to drive traffic. Even then, it’s difficult to see us talking about year-over-year gains of 20% or more come this time next year.